Home › Language and politics › Are we “citizens” or “taxpayers”? Are we “citizens” or “taxpayers”? Morrison picks up on an interesting variation between words that could largely stand for the same thing: people who have a vested interest in the United States. While consumer is probably too broad to be meaningfully compared with the other two, it’s my sense that citizens and taxpayers could be and often are used interchangeably. Of course, the two sets are not entirely the same: in particular, there are many taxpayers who are not citizens. Many people have moved to the US to live and work either on a temporary or indefinite basis. Even when they’ve entered the country illegally, they pay taxes including most paying federal income taxes. Of course, it’s important to note that there’s a widespread myth that presents many of these people as not paying taxes and instead benefiting from the system. It’s also possible that there are citizens who don’t pay any taxes, but this seems far less likely. Anyone who is not directly paying taxes, like many children, are arguably having taxes paid on their behalf, but many of these people are also probably not able to exercise full citizenship rights, especially since many would not be permitted to vote. Although perhaps sometimes used interchangeably, the choice of citizen or taxpayer is not without consequence as Morrison alludes to. Citizen seems to situate people as equal shareholders in a larger project that they are actively engaged in. Taxpayer seems to position people as the financiers of a project that they are only passively attending to. Importantly, the two terms also seem to differ in the importance placed on each individual. Citizens are all, in theory, equal within the institution of government, hence the reason why one might talk about second-class citizens. The very notion of second class citizenry is counter to the idea of citizenship, hence its use as an implicit criticism of discriminatory practices and laws. In contrast, taxpayers are not necessarily equal. We can, and I believe often do, see the amount of taxes people pay as entitling them to a greater or lesser amount of accountability from government to their interests. Hence, if Morrison is correct about the supplanting of citizen with taxpayer, then this would reflect a rather different way of presenting individuals’ relationship with the government and society. Thus, I decided to see if I could do a data-driven examination of these two words. I started by looking at the question historically. The best datasets I know of come from the New York Times (from NYT Chronicle), TIME magazine (from Mark Davies’ TIME corpus), and Google Books (Google N-grams). First up, the New York Times with data starting in 1851 up to the present. Unlike the rest of the data I present here, this data shows the percentage of articles that contain the word of interest. 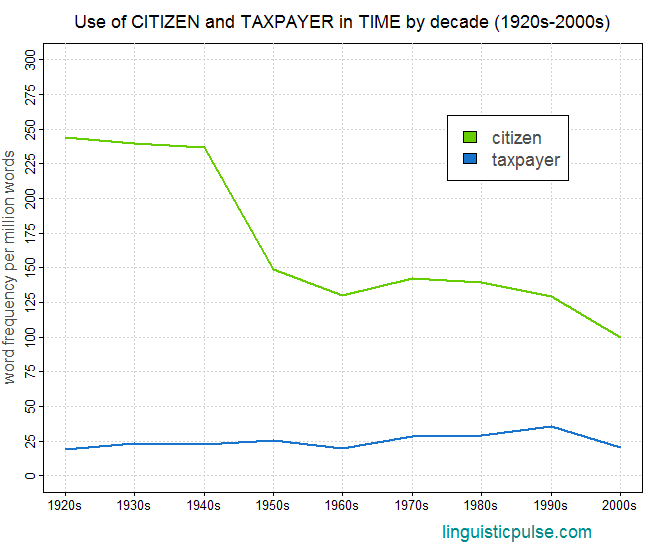 Here we see that citizen remains more frequent than taxpayer, suggesting that we haven’t really stopped calling ourselves or being called “citizens” in favor of “taxpayers”. 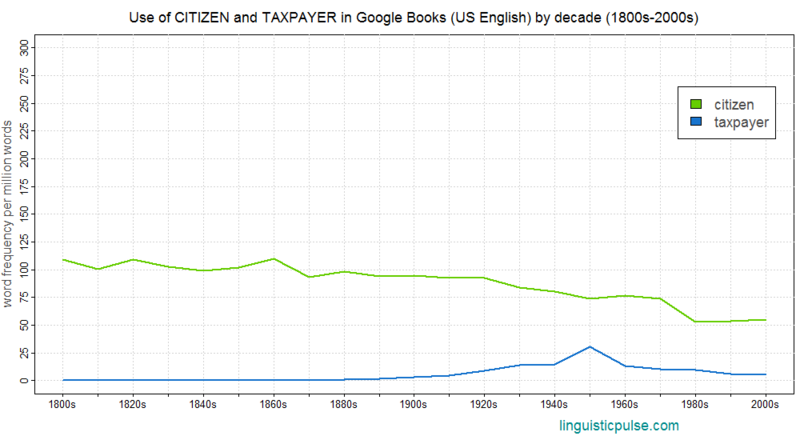 Nonetheless, there is evidence that the two terms have begun to converge over the several decades with citizen being used far less frequently than it was in the 19th century, and taxpayer being used more frequently. A similar trend shows up in the TIME magazine data. The data shows each word’s frequency per million words within articles from each decade of TIME. Here we see TIME decreasing its use of citizen starting in the 1950s. Taxpayer on the other hand has remained relatively stable in the magazine’s usage. One more dataset is Google Books. Data here is also presented as each word’s frequency per million words within books from each decade contained in Google Books’ repository. A similar trend is evident here. Citizen has decreased over time. Taxpayer has gained a little ground. The data from news, magazines, and books are interesting especially since they provide excellent historic data. However, I think another data source is also quite illuminating: the use of these two words by members of Congress, available from the Sunlight Foundation’s Capitol Words. Here I provide a comparison of the two major US political parties’ use of each term from between 1996 and the present. As you can see the Democrats seem to favor citizen, whereas the Republicans use both terms roughly equally. This tendency has fluctuated over time however, as the plot below shows. 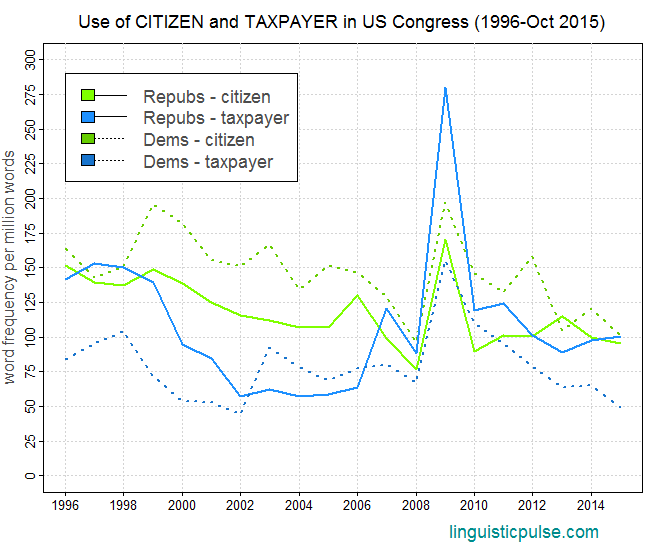 As you can see, the Republicans have oscillated back and forth, favoring citizen in one time period (especially from the late 1990s until around 2007) and taxpayer in another (such as 2008 through 2012). 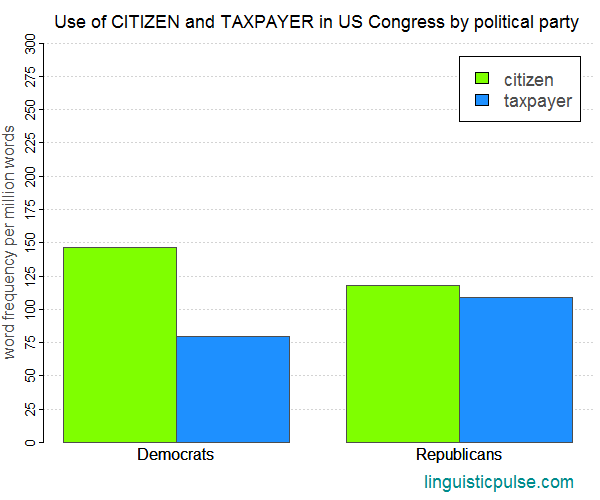 We might think of the tendency for the term taxpayer to sometimes replace or be used in conjunction with citizen as reflecting an expansion in the types of people that media producers and members of Congress are attending to. After all, in reality, the category of taxpayer includes many people that the term citizen excludes. However, since the term is more commonly used by Republicans, it would be prudent to try to interpret its use within the context of Republican ideology. One major relevant aspect of this ideology is the notion that certain groups, especially the working poor, the unemployed, and undocumented workers, do not contribute meaningfully to society. Rather, in Republican ideology, they simply benefit from the hard work of other more affluent individuals. Of course, this ideological proposition is a serious oversimplification of the situation, especially with regards to undocumented workers and the working poor. Thus, I would argue then that the use of taxpayer, rather than attempting to expand the category of people whose interests the government should be concerned with, the term is actually intended by Republicans to narrow it to that class of people who are imagined to contribute meaningfully to society and who therefore have earned the right to have their interests attended to. 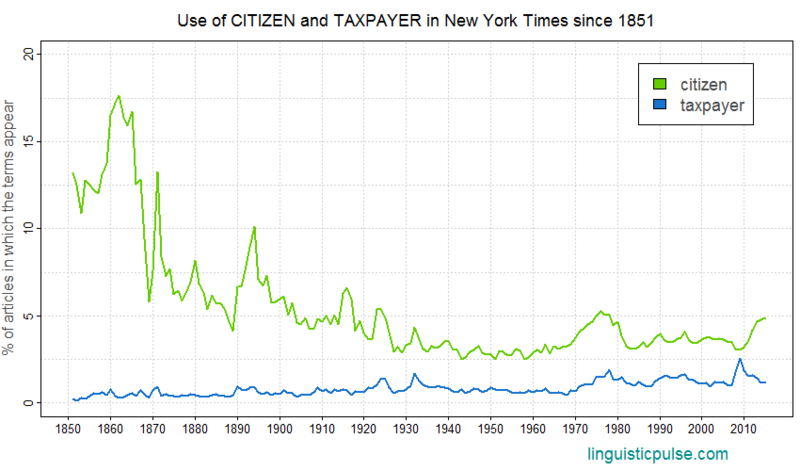 That Democrats and even so-called ‘liberal’ publications like the New York Times show signs of using taxpayer instead of citizen at times reflects the dominance of market ideology even within more progressive spheres. I wonder, however, whether this choice of terms could in fact be countered by raising the public’s awareness of who actually pays taxes and how much they contribute, especially in relation to how much they receive in benefits broadly defined. For example, consider funding for public education. Even if wealthy people pay more in terms of taxes, they also clearly benefit more by having the opportunity to send their children to far better funded schools. I wonder then whether attempts to educate people on these issues might turn the dominant understanding of taxpayer on its head, leading to a broadening of who it refers to and whose interests therefore should be attended to by government and by other institutions. It might for example encourage people to consider the interests of undocumented workers even though they are barred from voting. ‹ Trump fans aren’t spelling bee champions, but why do we care? I recommend to everyone Ursula LeGuin’s novel The Telling, set on a world where people are “producer-consumers”! hence could Republicans be taking advantage of the conventional narrower political use of taxpayer? Oh cool Mai! I’ve really enjoyed what I’ve read from LeGuin in the past. Will have to check this out. Hi Mura, I was considering doing a followup to this piece where I looked at this issue for the UK (though I’m far less familiar with the political context, so it’d be a bit tricky). Anyway, I wasn’t familiar with the semantic tagging in the Hansard corpus until you pointed it out. I took a look at it, and I’m not entirely sure I understand the tagging for taxpayer, which specifies it as… a building?… along with words like bench, room, house, building, etc. It seems to me to be erroneously tagged. Citizen, on the other hand, seems to be accurately tagged with a number of meanings that seem more or less relevant: inhabitant, deity (? ), right of class of persons, civilian life, and good behavior. Arguably, I think some of these concepts also apply to taxpayer, at least as it’s used in the US, specifically: inhabitant (maybe? ), rights of class of persons (although clearly different from citizen), and good behavior. So I guess the answer to your question is: as cool as the data these tags provide is, I’m not really not sure that the semantic senses really capture what’s going on ideologically with choices between these two words. In real estate, urban planning, and especially firefighting, a taxpayer refers to a small one or two story building built to cover the owner’s annual property tax assessed for owning a parcel of land. They are usually constructed with the hope that they can soon be redeveloped into a larger building capable of generating more revenue, or simply to hold a parcel of land along a new road or especially a streetcar line while waiting for value to appreciate. The building style was generally replaced with strip malls as the automobile became dominant in the mid 20th Century.